The HSM Campaign Hub provides you with information on the latest health & safety initiatives and how you can get involved. This issue, we examine the BOHS' Breathe Freely Campaign. Tracey Boyle, president of BOHS, the Chartered Society for Worker Health Protection, explains how the Breathe Freely message has been gaining traction since its launch, and why safeguarding the lungs of the nation’s workers is so crucial to achieving a healthy working environment for everyone. The Breathe Freely campaign, launched in April 2015 by the British Occupational Hygiene Society (BOHS), has its roots in figures which prove that tackling respiratory ill health is the single most important factor needed to reduce work-related ill health and mortality in the UK today. On 28 April 2015, Workers’ Memorial Day, BOHS, launched its first Breathe Freely initiative aimed at tackling the incidence of occupational lung disease in the construction industry. The society’s initiative was borne out of concerns that every year thousands of people in Britain die as a result of breathing in carcinogenic and other hazardous substances at work. An estimated 141,000 people who have ever worked currently have breathing or lung problems caused or made worse by work. Why the initial focus on the construction sector? People are often surprised to discover that construction workers in the UK are at least 100 times more likely to die from an occupational disease than from an accident at work. What’s equally shocking is that the vast majority of these deaths are due to cases of work-related lung disease or cancer, largely caused by workers having breathed in dangerous chemicals and dusts at work in the past. Because of this, at its launch, the Breathe Freely campaign was focused squarely on the construction sector. Again, it was statistical evidence which led the Chartered Society for Worker Health Protection to direct the Society’s efforts in this way. In addition, the construction industry has the largest number of reported cases of occupational lung disease of any industrial sector, including conditions such as lung cancer, silicosis, asthma, chronic bronchitis and emphysema. 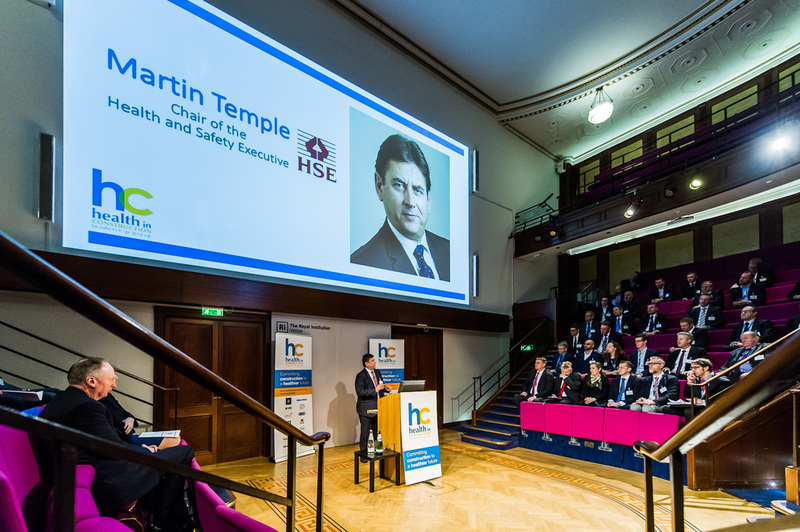 Since the successful launch of Breathe Freely with its founder partners – the Health and Safety Executive (HSE), Land Securities, Mace and Constructing Better Health – the initiative has attracted unprecedented levels of support from employers, trade unions and other influential people and organisations in its first activity-packed two years. BOHS has now signed up more than 160 supporters from across the construction industry and over 60 Breathe Freely talks have been delivered at roadshows, events and meetings across the UK, all designed to offer practical advice on managing health and equipping attendees to make improvements on their sites. 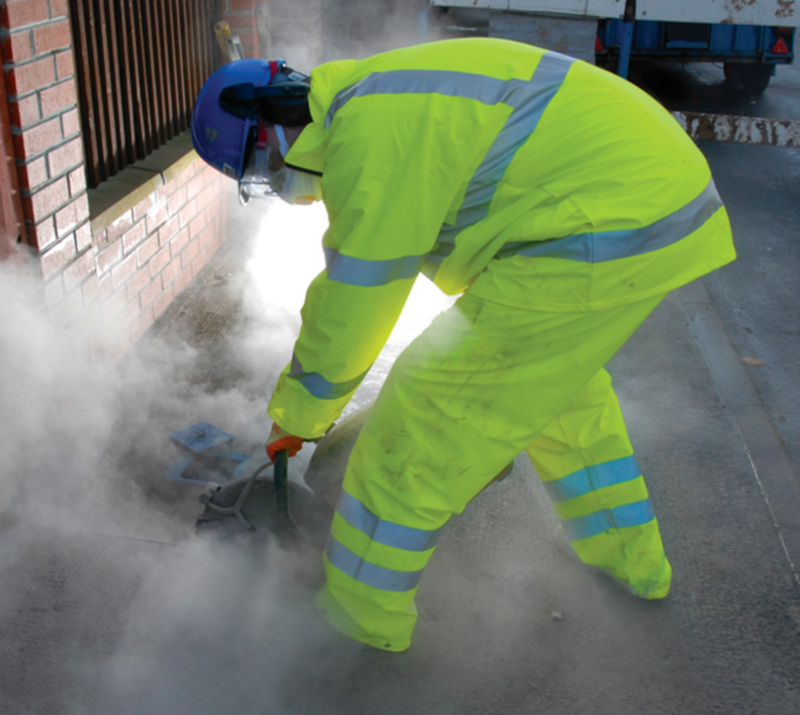 The challenge we face is that work-related lung hazards such as asbestos and silica dust are invisible and silent. Moreover, the effects of these hazards have a long latency. Unlike a workplace accident where the tragic consequences are immediately clear for all to see, the effects, for example, of breathing in silica dust during abrasive blasting work will take many years to become apparent. These complexities make it difficult to measure the progress of the Breathe Freely initiative, since we will only have proof of our success in years to come when we see the illness and mortality figures declining, which of course is what we greatly hope for. However, right now, our Breathe Freely campaign is based on the simple premise that we can protect workers’ health and actually prevent deaths caused by lung cancer and other respiratory diseases through good occupational hygiene practice. To put it simply, by recognising the hazards, evaluating the risks, and controlling exposures today, we can make a huge difference to worker health in years to come. 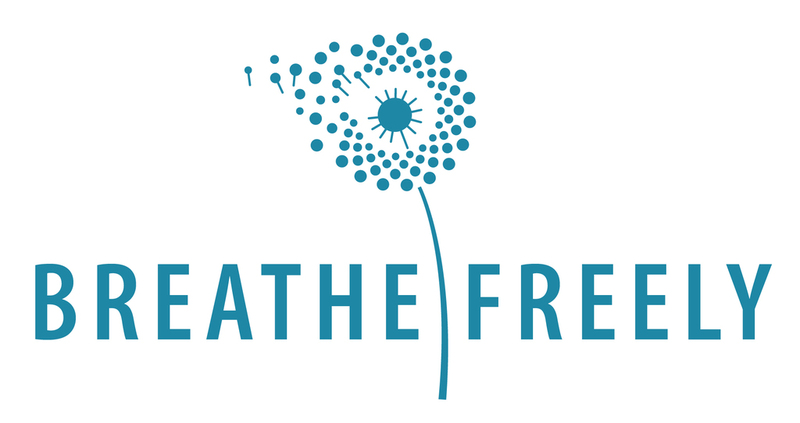 The Breathe Freely website (www.breathefreely.org.uk/) has been developed as a central part of the initiative to offer a wide range of useful, practical and free resources, to protect workers’ health. The website features free guidance materials, including best practice case studies, fact sheets and a Good Business Case proving that not only is good occupational hygiene the right thing to do but it makes excellent business sense too. In April 2016, the Society launched the Health in Industry (HI) Management Standard, designed by the UK’s leading occupational hygienists, and setting out best practice criteria for worker health protection. Essentially, the Breathe Freely HI Management Standard is a self-assessment tool which sets out exactly what “good” looks like in managing workplace health risks. The idea is for companies to sign up to the Standard and then self-assess how they are performing. 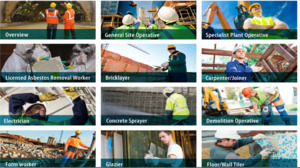 Using the HI Standard’s solid framework of good practice, construction managers will be guided to focus on the prevention of work-related ill health, for example putting controls in place and ensuring compliance with exposure limits rather than simply relying on respiratory protective equipment (RPE). The latest version of the HI Management Standard now offers a unique level of user-friendly detail, including sample questions and evidence points, to truly support managers through the process of achieving the HI Standard. So far, over 130 contractors have signed up to adopt the HI Management Standard tool for self-assessment in managing workplace health risks. In addition, a construction managers’ toolkit, sponsored by Arco, offers checklists, visual standards and presentation material to assist managers in delivering talks to protect workers’ lungs. These toolbox talks introduce basic occupational hygiene controls, such as fitting a simple ventilation system or water supply to tools, which make a huge difference in the exposures of workers to the hazards that cause lung disease. The approach with these training talks is extremely practical, for example emphasising that respirators need to be of an appropriate standard and face fitted, in order to be useful. 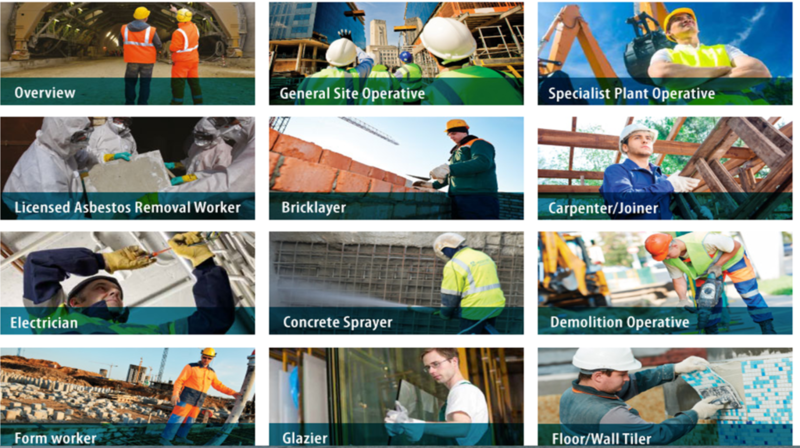 We urge construction companies to take advantage of the toolbox talks on the Breathe Freely website which will form a concise summary of the health hazards arising from the construction industry and how to address them. We hope that the increased support and take-up of our guidance means that employers are becoming more aware of what the hazards are and how they can control these – and that they are putting these safeguards in place. A key message of the Breathe Freely initiative is that effective occupational hygiene solutions need not be complex. In addition, effective controls do not necessarily have to be expensive. Often what is needed is an inexpensive, straightforward solution which can offer significant pay-offs in terms of creating efficiencies and reducing costs. In fact, the business case for occupational health and hygiene is strong and convincing. It can bring a significant return on investment, improve employee relations, demonstrate social responsibility, and enhance a company’s reputation. In October 2016, BOHS revealed plans for a brand new Breathe Freely initiative to prevent occupational lung disease in the manufacturing sector. Breathe Freely for the manufacturing sector will be launched around the time of Workers’ Memorial Day in April 2017, to run in tandem with the Society’s existing construction-based initiative which will continue. To complement BOHS’ construction-based initiative, a new website is being developed, packed with practical, free resources, such as fact sheets, case studies and other tools, all specifically tailored to help employers in the manufacturing sector protect their workers’ respiratory health. Medical statistics suggest that workers in the manufacturing sector have rates of occupational asthma that are about three times higher than the all-industry average. The new Breathe Freely campaign will be launched in partnership with: EEF, the manufacturers’ organisation; HSE; The Welding Institute; the TUC; and a number of other leading manufacturing organisations. 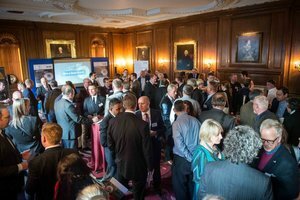 A wide range of further organisations, both public and private, will also be invited to sign up as supporters and sponsors, in order that the message extends to a broader variety of workplaces in the manufacturing sector, throughout the UK. With the aim of maximising improvements in respiratory health protection at work, BOHS has confirmed the initial focus will be on the key area of welding activities in manufacturing. Every year, breathing metal fume at work also leads to some 40 to 50 welders being hospitalised with pneumonia, with the disease killing around two welders each year. Besides pneumonia and cancer, welding work is associated with numerous other respiratory ill health conditions, such as asthma and metal fume fever, as well as short-term irritation of the throat and lungs, and reduced lung function. In November 2016, the HSE published its latest, finalised statistics for health and safety at work in Britain for 2015/16. These indicated that during 2015/16, a shocking 1.3 million workers were suffering from a work-related illness, either new or long standing. We also know that 99% of deaths caused by work can be attributed to ill-health, and 1% to poor safety, given that every year in the UK about 13,000 people die from diseases which were caused by the work that they do, or used to do, whilst in 2015/16 precisely 144 people were killed in accidents at work. These figures can be daunting, and realistically, present a burden which cannot be resolved by any single employer, trade union, professional society, government agency or even regulator working alone. Indeed, there has been a growing realisation that a collaborative approach is the key to successfully tackling local and global work-related ill health. 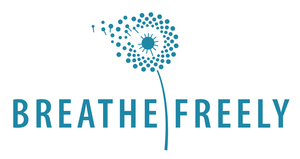 Breathe Freely was launched at the outset as a collaborative initiative and has continued to draw in an increasingly wider pool of stakeholders, with gratifying synergy in evidence between employers, regulators, trade unions and professional bodies, as we work towards the common goal of safeguarding respiratory health at work. There are, finally, encouraging indications that work-related health is moving away from its Cinderella status into the spotlight, as awareness grows of the shocking historical disparity between management of health risks, as opposed to management of safety risks, across a wide range of sectors. 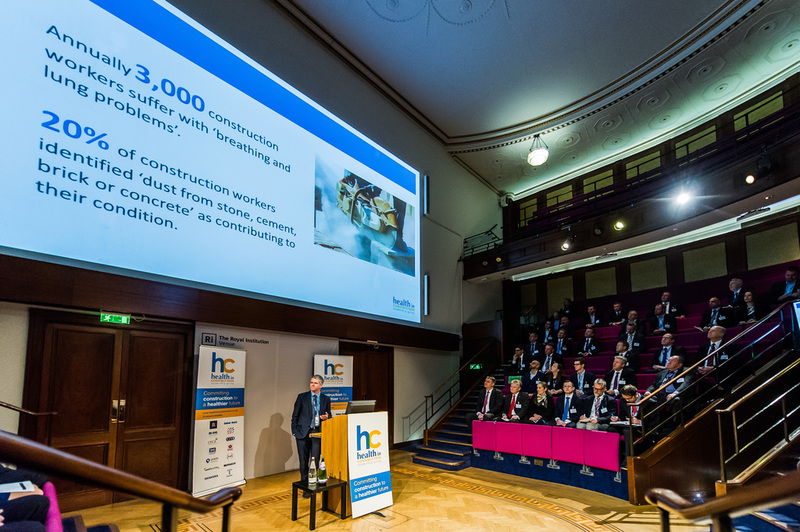 As an example of this trend, in January 2016, over 150 chief executive officers and other senior leaders in the construction industry met in London at the inaugural Construction Health Summit. 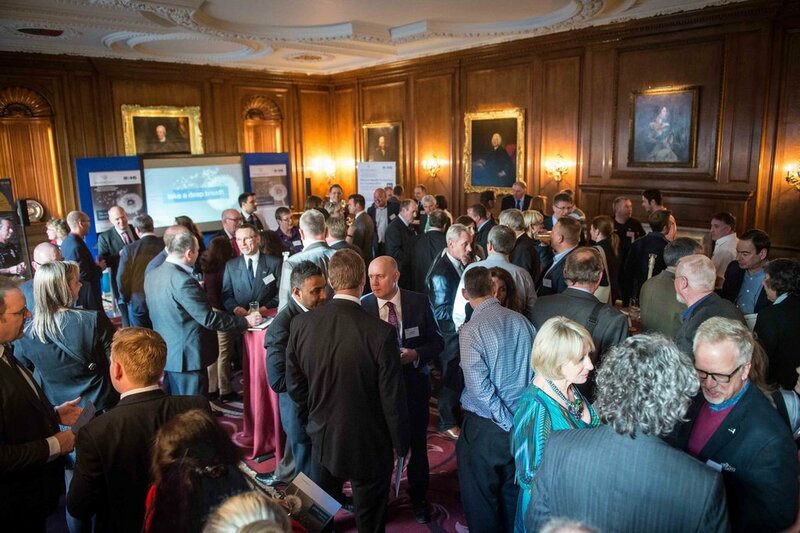 At the event, organised by the Health in Construction Leadership Group (HCLG), an alliance of contractors, clients, the HSE and other trade and professional bodies, including BOHS, the CEOs committed their organisations to a healthier future and to treat health like safety in the future, so that health and safety are given equal priority in future. Clearly, the commitments of the Construction Health Summit correspond fully with the goals of the Breathe Freely initiative. The Summit was followed up on 21 April 2016 by a second Health in Construction event, also organised by the Health in Construction Leadership Group (HCLG), at which over 150 leaders responsible for health and safety in the UK construction industry met to agree to reduce respiratory disease in the sector. During this meeting, Britain’s distinguished record on safety was acknowledged, noting that over the last 40 years, since the coming into effect of the Health and Safety at Work, etc Act 1974, a major cultural shift in safety led to an 80% reduction in fatal workplace injuries. Those present at the event committed to making “transformational changes” to eradicating the ill health effects caused by work, embracing the new challenge of bringing health on a par with safety. 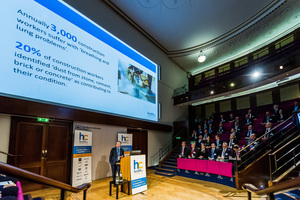 Another Construction Health Summit took place on 26 January 2017 at the Royal Institution in London where construction CEOs and senior leaders reflected on progress made, one year on from the first Committing Construction to a Healthier Future event to eradicate construction worker ill-health and disease. In an unprecedented move, what we are now beginning to see is construction companies uniting in support of the mutual goal of worker health protection, sharing good practice and reaching collective agreement on the best ways to help ensure workers are working in not just a safe environment, but a healthy one too. Increasingly, there is an understanding throughout the construction sector that the vast majority of occupational ill health is preventable. A busy schedule of activities is lined up for the Breathe Freely initiative during 2017 and beyond. We at BOHS have identified an important skills gap within the construction sector which we intend to act upon and fill by means of a new course, entitled the Certificate in Controlling Health Risks in Construction. This new course has been specifically designed to assist construction employers in upskilling their workforce in the basics of health risk management and control. 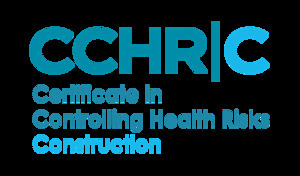 The course, largely aimed at site supervisors, will enable better recognition and control of health risks. Those who attend will learn to identify the most commonly present hazards on construction sites, and how they can affect health, as well as understand the principles of risk control, in order to recognise hazards and health risks in the construction industry. The course was piloted on 30 January 2017 and launched shortly thereafter. In addition, 2017 will see a new calendar of roadshows on the go, with the RVT Group as a main sponsor, and the emphasis as ever on imparting practical advice to make real positive changes on sites. Also planned is new more detailed guidance on managing respiratory protective equipment, (RPE) so the year promises to be another busy one for the Breathe Freely initiative. With Breathe Freely in full swing in its second year in the construction sector, and poised for action later on in 2017 in the manufacturing industry, the message of the initiative is absolutely clear - by protecting the lungs of every construction and manufacturing worker today we can make an enormous difference to worker health in future. Is artificial light making us sick?